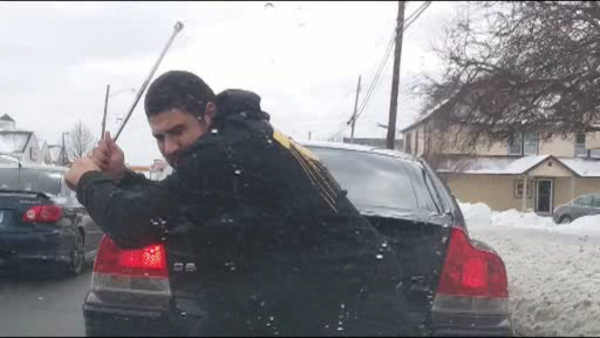 WEST HARTFORD, Connecticut (WABC) -- Police in Connecticut are searching for a man caught on camera swinging a crowbar at another driver's car in an apparent road rage incident. Investigators say a woman was driving in West Hartford on Wednesday when she got too close to a man walking on the side of the road. After he was splashed, the man got in his car and chased the woman's car about a quarter of a mile. Surveillance video shows him cutting her off, getting out, and swinging a crowbar at her car while she took photos. The woman wasn't hurt. Her car had damage to the hood, a headlight, and the rear passenger tail light. The suspect remains on the loose, but police believe the victim's photos will help track him down.